The big lumbering Disney castle built by Ludwig is a great sight. It rises over the alpensee. Long walk upto the castle through horse dropping infested roads. No pictures inside the castle , so got told of for it. All the rooms have Wagnerian themes , great fantasy land. With even a plastered artificial cave. After flying around for some twenty eight hoursvo finally made it to munich and got too see the spectacular first snow of winter. I was so tired that I kept forgetting bits, hence I splurged on a cab instead of taking the train to wessling. So far research is beating about the bush. I should be able to detect water based permitivity change in canola. So I finally have my full license and my poster for Germany is in my hands. I could go out and have a drink at the electric light and drive home, but I decided not to be road kill. of field samples. A terabyte of multiple frequency SAR data has been delivered to me , now I have to wade through it and fill the simulation and analysis gaps. Finally another weekend to get away from radar backscatter and taste some wines and hang out at the F party with my shovel. Friday went for a drive with the GA crowd to litchfield national park. Nice day splashing around waterfalls and pools. Finished off with dinner at the duck's nuts. So finally had the mandatory conference fun day. Lots of drinks flowing and lots of dancing macarena. There were owls and pythons on display. I left while I was ahead , the rest have a pretty hazy memory. A conference is all about meeting people and making absurd comments. Nervous phd presenters revising their stuff a lot of times, some just along for the food. Now it is going to be easier to post than ever. First very slow day of conference. Staying over at the fun cavanagh, a big party was in full swing when I arrived. This is going to be awsome. There seems to be a large demand for QGIS with both Grass and ECW, now that gets tricky. Grass causes indigestions in MSVC and ECW spits at MingW GCC. So I will try to build a sans-Grass ECW based release for those users. On another note now that blogger finally works in Opera I will be switching to it full-time. Only using FireFox to make some shadow posts in my other blog since I have a saved session there and no password. So in a frenzy I decided to change all my passwords and forgot to remember them. Now that is a good thing since my last blog might have been calling up stalkers. So here begins the new confused life. Finally I have made a Qgis 0.9.2 RC1 Windows Installer while battling with my head cold. It is out in the wild for testing, hopefully virus-free. This seems to be the story of my life when returning from conferences - things are in a mess. 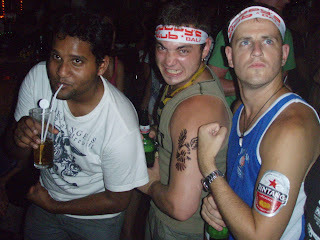 Otherwise this post was going to be about the magnificent trans-Bali trip to Mt. Batur and back. Since all the photos are somewhere in Germany I have more niggling issues that has to wait. I passed the citizenship test by the way, glad that's out of the way. I am going to discontinue this blog due to ... cold and flu for a while. Today I caught up with Marieka who could not get a flight out and is stuck here till Sunday. So I at least have some quality company for a few days. 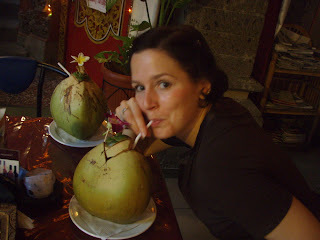 I got to introduce her to Kelapa Muda which she apparently had never had before. 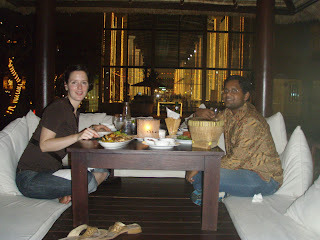 We occupied a gazebo for dinner near the beach and planned an outing to Ubud tomorrow. 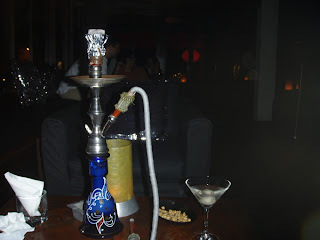 Then I hot the classy Hu'u bar in Semniyak and indulged in some Lychee martini's and a sisha. So after nearly 4 days of hard conferencing I have settled in Kuta to relax for a few days. If you can call partying all night relaxing. I am staying in a small beach side hotel called Melasti , it has nice old buildings and garden and a couple of pools. The beach is a stone's throw away as is the mall. 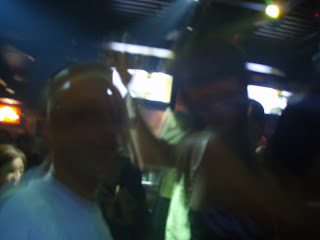 The nightlife is a short taxi ride and you can stagger your outing properly to hit the right spot at the right time. 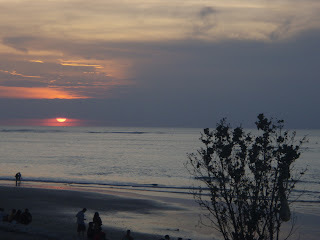 I started with dining on the beach while watching the sunset and moved onto Poppy's and Bounty. Big aussie crowd here - not hard to make friends and across the road there was a band playing. Most of the time was spent dancing in front of the air-con and fan for position. When Poppy's died down I headed to MBarGo and ran across a few familiar faces seeming to have a lot of fun with the locals. When I ran out of steam a short cab ride dumped me right on my bed. So I have finally arrived at the conference. The balcony has a superb view over the garden. The rooms are quite stylish too. Here are a few photos to whet your appetite. The long-long queue at the airport was definitely worth it. I again got into trouble over my dog-eared passport, can't wait to get a new one. Stealing a minute .. boarding flight to Denpasar in Perth. See you on the other side. So I caught too early a bus out of Adelaide after doing my test. Since there are like 6 buses to Woodside per day I have to wait for an hour for my connection. By the way the test went well the only thing I am unsure about is who has the right to free speech in Australia, Australian citizens only or everyone. Meanwhile sitting on the dirt by the roadside I have prime view of the tour down under. All the peletons going past for the steep and windy hill climb just ahead. So found a shady spot and settled in for the wait. May be I will capture a bike pile-up, fingers crossed. After all the hard reading for weeks, I can recite the Australian Citizenship book by heart. So, ask me anything .... When did Abel Tasman visit Van Diemen's Land ? When was the Eureka Rebellion ? On the brighter side apart for some legal hassles my PhD enrollment seems to be going through, I have also got my P2 licence so I do not have to carry those ugly red P's around. Hopefully it will be ready today, otherwise it will be a day wasted.